Yaakun was delivered by Italy's Nicolini yard in 1987 for a Middle Eastern royal family and originally called Al Menwar. In July 2006 this superyacht was acquired and refitted by a European owner for a two year circumnavigation of the world's oceans. 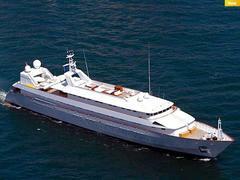 Lloyds classed, Yaakun accommodates 12 guests in a master, VIP and four double staterooms plus up to 22 crew in 11 cabins. Yaakun is asking $30 million.